Have you unlocked flying yet? 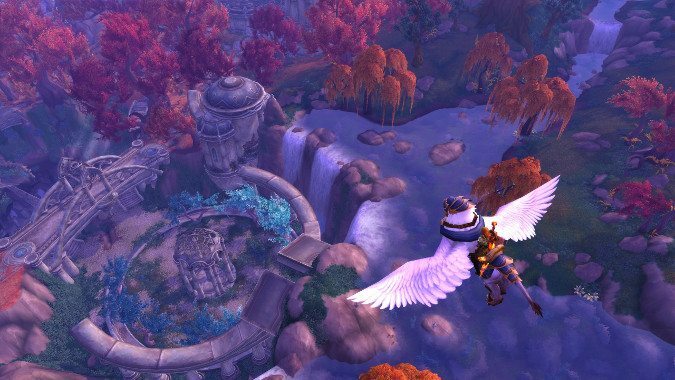 Now that Blizzard has removed the Legion Assault achievement from the list of requirements to unlock flying in this expansion, the path to flight is open. If you completed Broken Isles Pathfinder Part 1 before Patch 7.2 went live, then the only requirements to finish Part 2 are exploring the Broken Shore and getting to Revered with the Armies of Legionfall. Many players seeing flight within their grasp, found clever ways to grind Legionfall faction quickly over the weekend. Broken Shores World Quests were not only a source of faction, but Legionfall supplies which gave additional faction when turned in for building construction. Some players even used realm hoping to farm chests around the Broken Shore for even more Legionfall supplies. The supplies could also be acquired as bonus loot from missions (even non-Broken Shore missions like those that have dungeon loot as the main reward.) And, of course, there were missions that rewarded straight up Legionfall rep.
Players that stacked reputation bonus items also had a leg up on the race to get to Revered with Legionfall faction. Those with the Darkmoon Faire rep boost hat, the human racial bonus, and/or the mage rep bonus all took less time to hit the magic number to unlock flying. For those of you wondering, the special class flying mounts we were promised won’t arrive until week 11 of Patch 7.2 and you’ve hit Exalted with the Armies of Legionfall. So keep grinding that rep! Have you taken to the skies yet? Or are you still working through Part 1?